In order to successfully grow their online presence, we knew we needed to do an in depth audit of current performance. 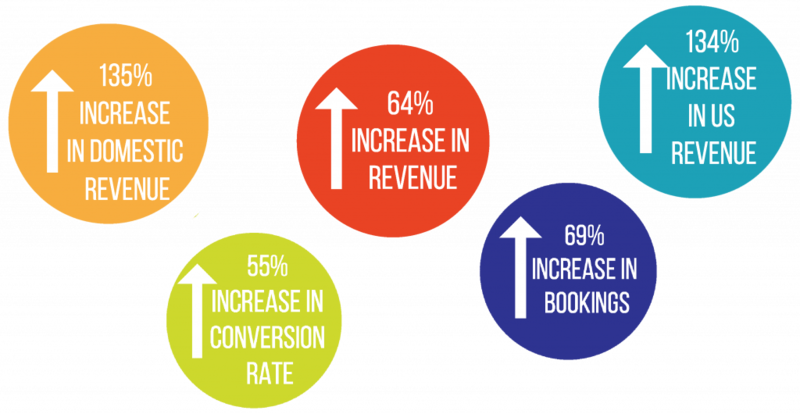 After analysing all the digital channels and devices accessible to their audience, we put together a strategy that focused on growth of International and Domestic visitors. Additionally to this, we underwent a gap analysis on current performance as well as having restructured and refined all paid search campaigns. This involved audience segmentation which is the process of dividing people into subgroups based upon defined criterion such as media use, demographics and so on. Remarketing Campaigns show ads to people who have previously visited your website and provide you with extra features specifically for reaching previous visitors. Bid adjustments are done so as to ensure that clients budgets on Paid Search Advertising are being distributed to the highest converting audiences. We identified a number of key areas where page content could be expanded as well as the potential for new content creation within their own site, assisting in attracting visitors to pages, increasing visibility and ensuring that we were positioning St. James Hotel & Club as the luxury property that it is. Our use of heatmap software combined with our data analytics allowed the team at St. James Hotel & Club to make subtle changes to their website which greatly improved the experience for their customers and had a positive impact on their conversion rates. Core Carried out an Audit in April 2018 identifying issues and opportunities and based the strategy for 2018 around this. Once we kicked off the campaign, we compared results to the year previous to which St James Hotel & Club reaped the rewards. Caroline is a co-founder and director of Core Optimisation where we work with our clients to deliver digital growth through a combination of Digital Marketing and Conversion Optimisation Strategies. She has a passion and energy for delivering a high level of customer service with a strong focus on results and increasing direct online revenue for our customers. Core Optimisation is a performance-based digital agency which helps you grow your online revenue. Our starting point is always you. We get to know your brand from the inside out and the outside in. If you’re interested in learning more give us a shout!